That’s right, moss. No laughing! Moss is serious stuff when it comes to the sparkling green world of the future. Think bio-energy and it all starts coming together (shoutout to University of Cambridge for exposing the “hidden power of moss”). The problem that Goodyear is attempting to solve is one of those personal mobility conundrums facing urban electric vehicle drivers. Say you have a zero emission electric vehicle, and you have solar panels at home so you don’t have to worry about stray carbon emissions from your local grid mix. That’s good as far as it goes, but when you drive around the city, you contribute to traffic congestion, and that’s where things get sticky. With thousands of conventional ICE engines crowding the streets, your vehicle helps add to their pollution load. I know, right? They should all be driving electric vehicles, but the reality is they are not, and auto industry stakeholders — Ford is a good example — are taking a closer look at urban mobility solutions that help cut down on traffic. With all that in mind, wouldn’t it be nice to drive an electric vehicle that helps compensate for congestion-related pollution, by cleaning the air as it goes. According to Goodyear, the main perk is a tire that actually “inhales” carbon dioxide and releases oxygen (that’s where the moss comes in). The company points out that for a city about the size of greater Paris, the result would be the elimination of more than 4,000 tons of CO2 yearly, so imagine what would happen if every electric vehicle had moss growing on its roof, too. 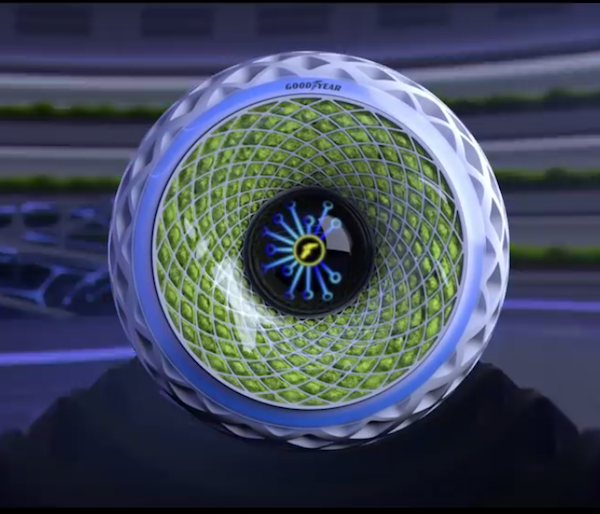 Oxygene harvests the energy generated during photosynthesis to power its embedded electronics, including onboard sensors, an artificial intelligence processing unit, and a customizable light strip in the tire’s sidewall that switches colors, warning both road users and pedestrians of upcoming maneuvers, such as lane changes or braking. That’s quite a heavy lift for moss, so we’re wondering exactly what kind of moss Goodyear has discovered, or if the company has developed its own super-moss. If you have any ideas, drop us a note in the comment thread. On the lifecycle side of things, the new concept makes use of recycled rubber and it has a non-pneumatic structure that helps stretch out its lifespan compared to conventional air-filled tires. If all this is beginning to sound more sci-fi fantasy than possible reality, guess again. Urban populations are swelling, and individual cars are swelling along with them, electric vehicles or not. Some cities are tackling the problem by making it more expensive to drive in congested central areas during peak times. For example, last May London banned cars altogether — electric vehicles or not — from an intersection at Bank station during daytime hours. Taxis and trucks are also included in the ban. The new measure is expected to improve air quality in the immediate area and stop the bleeding (the intersection is notorious for its sometimes fatal hazards to cyclists and pedestrians). Also last year, Barcelona announced plans to ban older cars and vans during working hours, and Munich fell under a court order to start planning for a diesel car ban. Back in 2016, four other cities articulated the need to at least ban diesel cars and trucks as early as 2025. That included Paris, Madrid, Athens, and Mexico City. In the latest painful news for diesel fans, just a few days ago a German court ruled that individual cities in the country have the right to ban diesel cars. CleanTechnica smells loopholes in the air, but even if the ruling loses some of its punch, the threat of a ban may motivate drivers to look elsewhere for their next car. Whether or not that will be an electric vehicle remains to be seen, but here in the US the state of California is not waiting around for fate to decide. Earlier this morning our sister site Gas2.org (via our other sister EVObsession) reported that California has pumped up its electrical vehicle mandate with the goal of 5 million cars by 2025. There are only about 350,000 electric vehicles in California now, so that’s a pretty big plate to fill. The state is depending on the “clean diesel” scandal settlement funds from Volkswagen to help ramp up its charging station infrastructure, and for you hydrogen fans the new goal also includes fuel cell electric vehicles. As for Goodyear, the company is heading on a “green journey” aka transitioning to a more sustainable business model aka risk avoidance. The vision of a moss-covered tire may be far off in the future, but back in 2015 the company did begin introducing silica derived from rice husks into its supply chain, so there’s that. Check out more about the moss tire on YouTube.